Many historians argue that in a pre-market, farm economy, women enjoyed something much more like equality. On a family farm, men and women typically did different jobs—men did heavy field labor, woodwork and repair, and worked with large edge tools: women typically did food and clothing preparation, and food preservation. Children were raised by both. A farm simply could not survive without the skilled labor of both men and women, and in this sense men and women's contribution to the economy of the family farm was equal. True, the law clearly favored men, and gave women few formal rights. But in a world where most people made their own food, clothing and shelter, rather than buying these things pre-made, a farm wife's labor was crucial to the family's basic survival. But as a subsistence economy began to be replaced by a market economy, in which more and more household goods were bought instead of made at home, women's household work became literally less valuable. A farm family could buy cloth instead of making it; could buy prepared foods--even canned food, by the 1850s--instead of preserving it themselves. 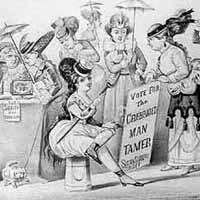 Women's work became less crucial in the Jacksonian era, as market goods increasingly replaced goods made in the home. Men and womne's relationship to each other had radically changed. In light of this change, and in light of the sweeping promises made by the American revolution, Americans began reconsidering gender roles. On the one hand, some argued that women should concentrate on the home and domesticity—that women had an especially loving and gentle nature, and that they werre naturally suited to child care and to the "domestic arts" of decoration and nurture. In this line of reasoning, the man's world was understood as tough, rational, self-advancing, competitive, and harsh, and the woman's world was soft, irrational, emotional, self-sacrificing and loving. 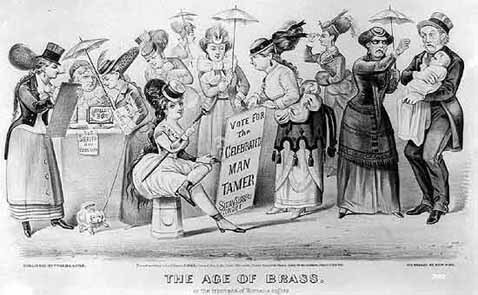 Women should not vote, or work outside the home, or be involved in politics, this line of reasoning argued: they should work to reform society by raising moral children. Some historians call this a "sentimentallization" of women and the home. Debates like this deeply upset tradition: they suggested that women were equal to men and did not naturally desire subordination. 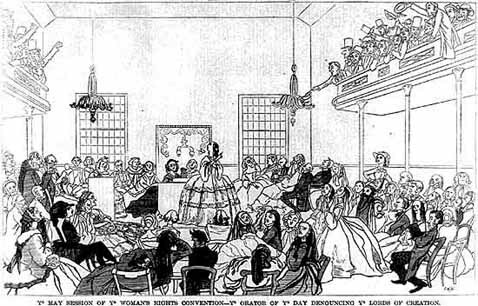 This cartoon, published in Harper's Weekly, June 11, 1859, mocks the sight of women insisting on their rights. If women are equal, it suggests, men are diminished and marginalized.